First thought that comes into your mind: Butter Cookies with almonds. Oh, how I’ve fooled you! 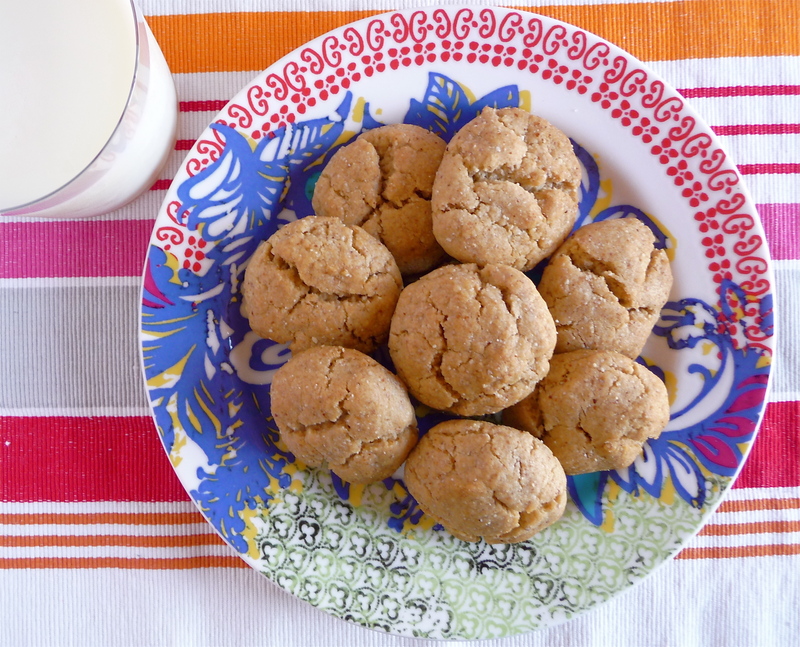 These are not butter cookies at all, they’re Almond Butter cookies. No butter! Vegan! Sweeeet. And I feel extra special because I made the almond butter for the Almond Butter Cookies. I should get a gold star. Well, maybe. It’s not like Almond Butter is hard. It’s really more sticky. Easy yes. Hard no. Here’s how we do: toast some almonds (a giant cast iron skillet, medium flame, stir every 30 seconds or so until you smell toasty almonds, remove). Put into food processor. Blend on high until almonds basically liquefy. Or butter-fy. Let’s call it what it really is. I drizzled in a tablespoon of canola oil as it blended to speed it along. And a dash of salt. Mmmm. Salty Almond Butter. Now the Almond Butter lives in my peanut butter jar. Because all the peanut butter was gone. By no fault of my own. I blame Daniel. And the Kitchen Gods. It wasn’t me! Promise. These cookies are super easy and can be made in exactly one bowl. We like one bowl. In this case, my Kitchenaid mixer bowl. Double sweeeet. Did I mention these cookies are vegan? And delicious? And really, really easy to make? Oh, and I served them with raw cow milk from the farmer’s market. Which made them triple sweeeet. Cuz it’s a whole lotta raw on raw action. Raw almonds. Raw milk. That’s pretty raw, dude. Sift dry ingredients together in your mixing bowl. Start mixing at low speed and gradually add in almond butter, maple syrup, vanilla and oil. Once fully combined, mixture will be a little crumbly. Use a tablespoon measuring cup to pull out pieces of the dough. That way they’ll be pretty uniform in size. Using your hands, form into 1-inch balls and place on a silicon lined baking sheet, space about 1-2 inches apart. If you don’t have a Silpat, spray a regular cookie sheet to prevent the cookies from sticking. Bake for 12-15 minutes until cookies are slightly browned on bottom and nice cracks have formed on top. Cool on rack or devour immediately. Or share with others. Be a nice person.